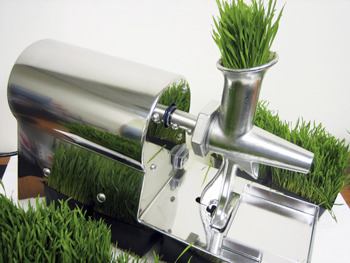 The Opti Fresh Wheatgrass Juicer may not be the smallest or lightest weight wheatgrass juicer on the market today, but it is one of the most durable and highest quality products to be found. 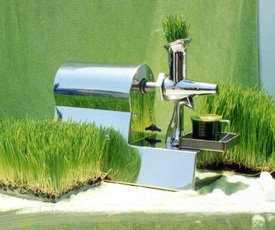 This is a commercial grade stainless steel wheatgrass juicer that is commonly found at juice bars, spas, and restaurants. Originally designed for one of the leading health resorts, it is a pleasure for homeowners to now have access to the Opti Fresh Wheatgrass Juicer! If you have ever tried to make your own wheatgrass juicer in a standard blender or even in a juicer not designed for leafy greens, you know what a disaster it can be. You end up with very healthy pulp (which does you no good!) and juice that is lacking that rich color the healthiest wheatgrass juice is known for. Fewer moving parts makes clean up faster. High juice yields for every blade of grass inserted. Constructed of highly durable stainless steel. Continuous pulp ejection for faster juicing process. Comes equipped with a plunger. That is why those who are serious about the raw foods way of life are now purchasing the Opti Fresh Wheatgrass Juicer. They want wheatgrass juice that contains rich, nutrient-dense juice and dry, nutrient-lacking pulp. That is exactly what they get with this juicer: rich colored juice packed with enzymes, vitamins, minerals, and other nutrients that the body needs.